When I cooked a simple version of Roti for you a couple of weeks ago, I used a heavy, flat cast-iron griddle that my wife bought years ago. Now, I have to admit that this well-used implement has always worked just fine for cooking flatbreads and so forth, but I am a bit of a sucker when it comes to new kitchen gadgets and when I saw the traditional Indian Tawa you see pictured above while shopping in Ottawa I just had to have it. 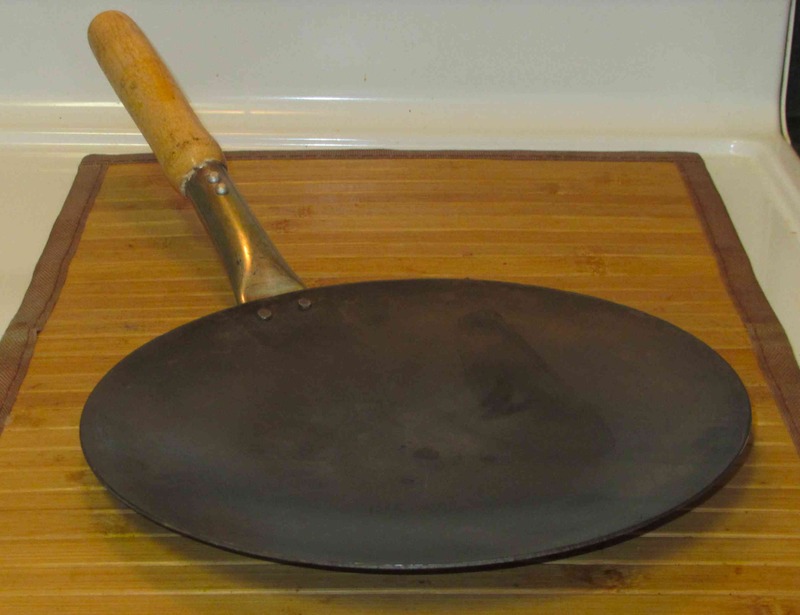 The Tawa, which is most commonly pronounced ‘Tava’ (and, indeed, often spelled that way), is a common piece of equipment in Indian kitchens and is used for cooking many sorts of flatbreads and crepes. Although some are flat-bottomed, the majority, as with my new purchase are very slightly concave. Mine is a small one, measuring about 9” in diameter, and though this is fine for doing single pieces of bread at a time in most homes, bigger ones are available as well. A very large one, at 24” can be seen for sale at here at Caribbean-American Foods, and it is probably just as well I didn’t see one of these on my recent shopping trip or I might not have been able to resist that variety either! Wikipedia, which seems to favor the ‘Tava’ spelling, insists on referring to the shape of these griddles as ‘convex’. Now, mine is convex too, if you turn it upside down, but the majority that I have seen pictured in cookbooks and the like are generally concave and include a handle of some sort. As it turns out, though, there are convex versions (typically quite large) and you can see a huge Pakistani variety cooking multiple pieces of bread pictured here. Anyway, the Roti I recently cooked for you were basically a variation on the basic Chapatti theme and, in that post, I also mentioned Chapatti’s more complex cousin, the Paratha. I am itching to try out my latest acquisition and I have a feeling that a meal featuring a pile of these flaky, delicious flatbreads is very shortly to be forthcoming. Check back later if you want to see how my Tawa performed…. I love your kitchen equipment posts too! I going to try to find your previous post on making the Roti. Thanks! I hadn’t had my coffee yet when I read your post and missed it. Looking forward to seeing your parathas, my favourite Indian breads !! I totally need this pan! I am so excited to try your Roti recipe!!! I have never had much luck with yeast breads, but I like Indian flat breads the best. My wife and I eat them a lot.